Please click on thumbnail to view details. This hand-carved and painted folding screen is made with black walnut wood for the curved and carved structural frame, and curly maple for the inset panels. 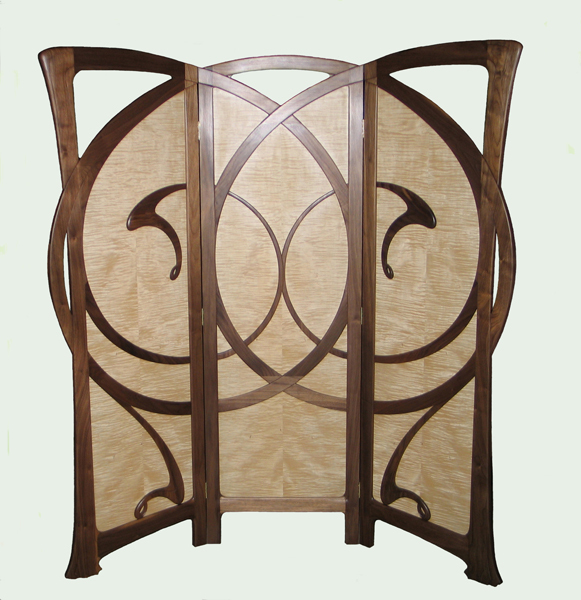 The Art Nouveau style screen design drew inspiration from a light autumn breeze stirring the leaves that are painted on the back of the panels. The front side features carved walnut bracing that suggests the tumbling and swirling wind. The overall dimensions of the screen are 71"H and 66"Width for all three panels. In the Spring of 2010, I received a phone call from a gentleman in San Francisco. 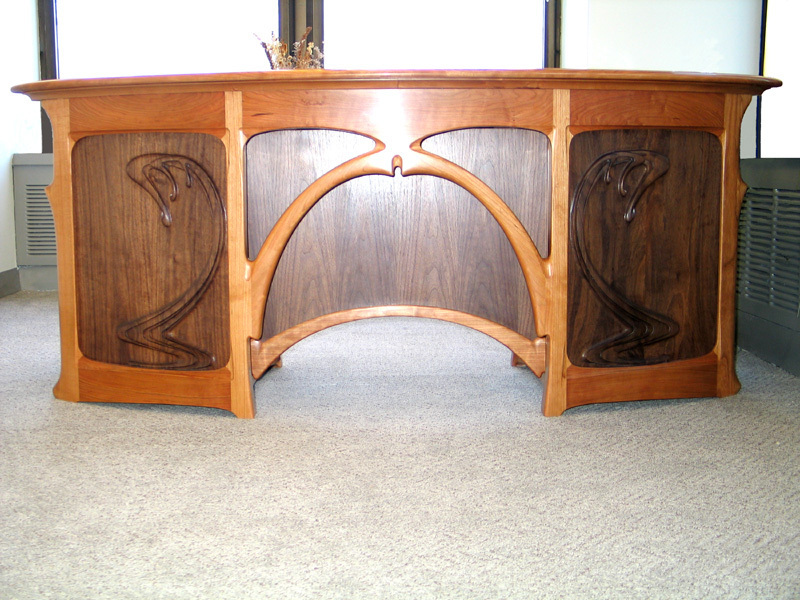 He had seen my Art Nouveau desk on the internet, and wanted a variant of it for his own use. We decided on 72” x44” dimensions for the parabolic desktop, which provided a practical working surface of 65” x 36”. He chose cherry and walnut for the woods. This desk has two file drawers on one side, and a graduated set of drawers on the other. A pencil drawer was also added. Although I often deliver furniture myself (especially to San Francisco), I was so overbooked at the time that I could not leave the shop. We built a crate for the desk and shipped it out from Boston, through a specialty carrier who normally serves the antique market. The desk arrived in perfect condition, and the client was ecstatic with his special delivery. The clients called with a unique dilemma. They were enamored with a pair of Art Nouveau period Armchairs they had seen at the Macklowe Galleries New York City. Based upon photographs of the armchair, they asked if I would be able to reproduce these antique chairs and create a Dining Room set for their new home in Weston, MA. I assured them that they could go ahead with their purchase of the antiques, and that once I had the chair we would be able to replicate them, and design a table that complemented the chairs. The antique chairs were purchased and analyzed, and the reproduction began. First we noticed that the antiques had suffered several breaks during their remarkable lifetimes and had metal and wood pins and braces on the undersides. Also, the finish on the antique chairs showed all the ingenuity of modern technology in glossing over these previous repairs. The originals had been made of pear wood, which was no longer commercially available in quantity and quality to create the matching pieces. We moved to a cherry wood as substitute, with the promise to match the color of the originals, and other period Art Nouveau pieces that the clients had collected in Paris. The carving, while challenging, proved to be the easy part. The finish was a very delicate yet deliberate sequence of steps, requiring many test samples and layers of color and tint added and removed. Finally, we succeeded in a very subtle blend which matched the originals. The upholstery took weeks longer than promised as well, but the day came when we were able to deliver the dining room to "ecstatic" clients in Weston. I was ecstatic to have pulled this off as well. This bed was inspired by the client's desire to intrigue their visiting grandchildren, while achieving a highly aesthetic design. We presented several designs that incorporated various animals, birds, insects, and flowers, and the final design assimilated elements from each. The butterfly, frog, ladyslipper and jack in the pulpit flowers were made as parquetry carvings, then applied to the head- and footboards of the queen size bed. In addition to the aesthetic considerations, the bed has an exceptional structural strength, in part to accommodate all those jumping grandchildren. As with many of our designs, this piece derives from our ongoing interest in the naturalistic motifs and sinuous lines of the Art Nouveau period. 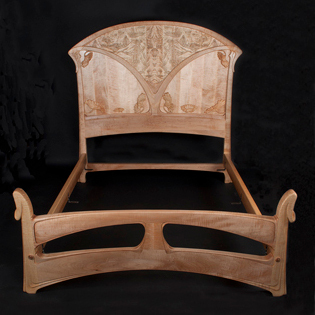 All of our bed designs can be made in any size, or combinations of woods to accommodate individual needs and taste. This design is part of an Art Nouveau dining room suite, and is rooted in several earlier sketches that I had made for other commissions. It was adapted and refined for a particular setting in the room, and reflects the scale, materials, and curving lines of other matching pieces in the large, open concept living-dining space. 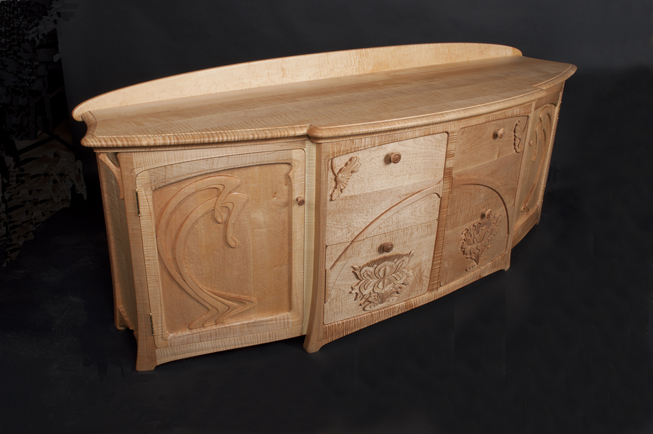 The cornice and base molding, drawer and cabinet handles, and corner brackets are all hand-carved from solid wood. This and other pieces in the suite are built from carefully selected and cut curly maple, with contrasting black walnut handles and solid brass hardware. 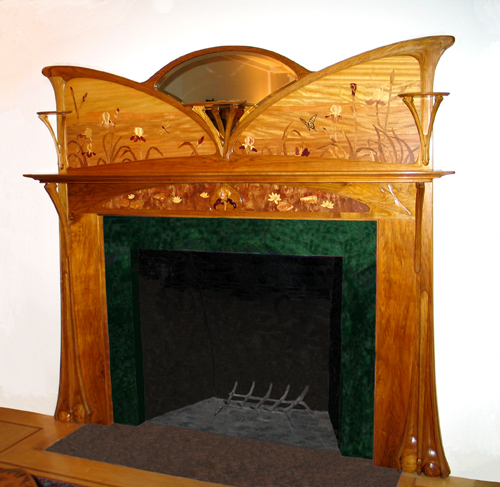 This Art Nouveau mantle is hand carved in butternut, with a wide range of exotic woods and veneers in the inlay and marquetry. This design was inspired by the flowing lines of Art Nouveau period furniture, and the marquetry design was derived from drawings of flowers in the clients' award-winning gardens. This imagery serves to connect the interior and exterior environments. This client saw images of the Mackmurdo Chair I had designed for a client in Los Angeles. She wanted to have a dining room set with 6 of these chairs, made in cherry wood. The table was to be a new but very basic design, in order to allow the chairs to stand out. 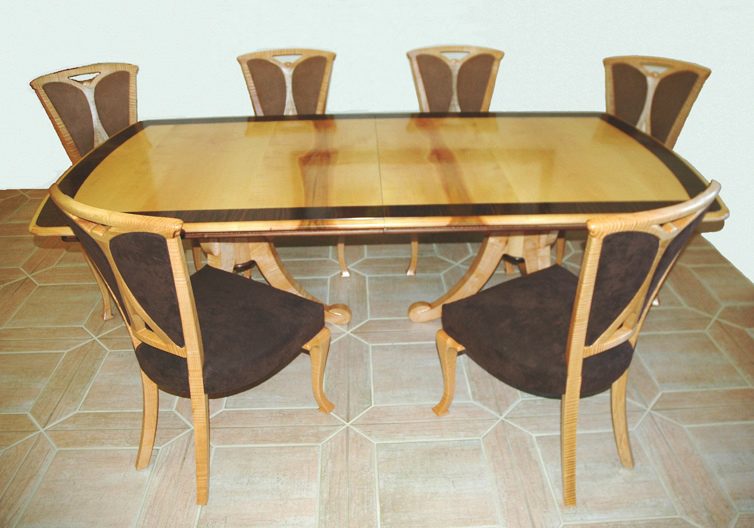 For this purpose we chose curly maple wood for the table, which provided great contrast to the ebonized back splats and rich cherry wood of the chairs. 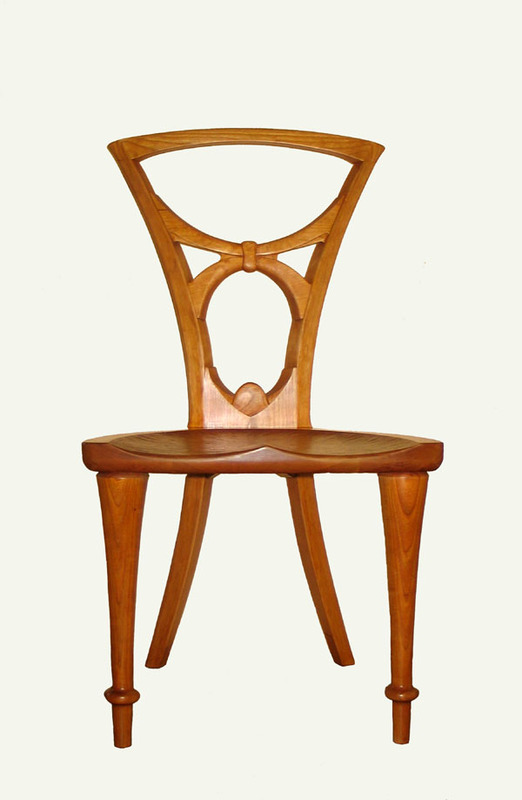 The Art Nouveau Mackmurdo Chair was derived from an original design by Arthur Heygate Mackmurdo (A. H. Mackmurdo) in 1888. 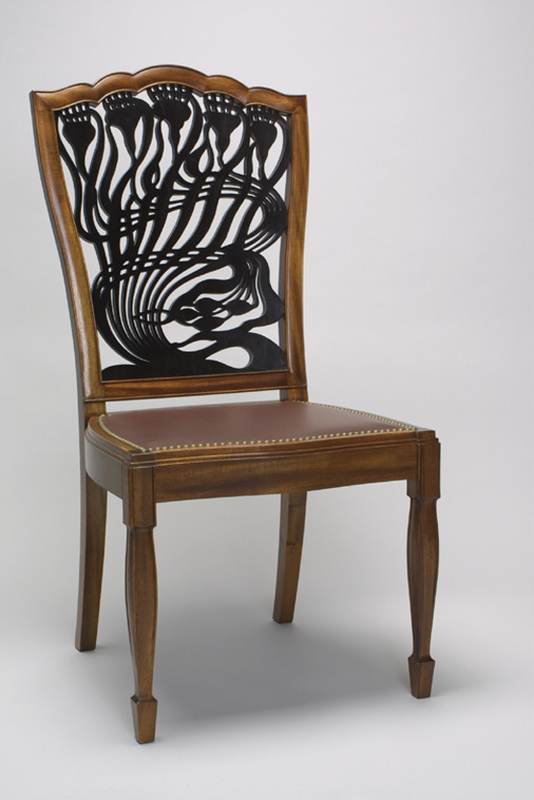 The backsplat of the chair mimics the famous Art Nouveau graphic design he had made of a thistle plant. Only two such chairs were made for his own home in the outer Hebrides. Of these two, only one survives in the collection of the Victoria and Albert Museum in London. 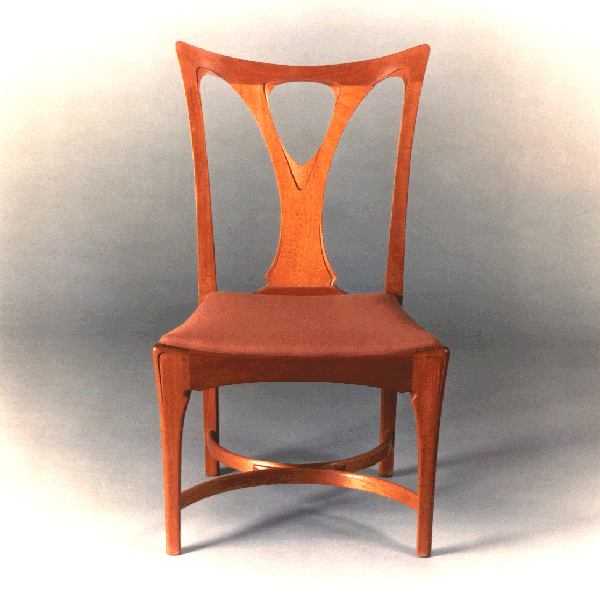 We had seen this chair published on several occasions, but were pleased to examine it carefully at the National Gallery of Art in Washington DC in 2000, as part of a traveling exhibition of Art Nouveau Design. My interpretation uses modern technology to create a multi-layered, curved and molded back splat, which was then cut with lasers based on a drawing that I had made and supplied. In this replication, the chair is significantly stronger than the original, and the delicate thistle design retains the boldness of its ‘hard-edge’. 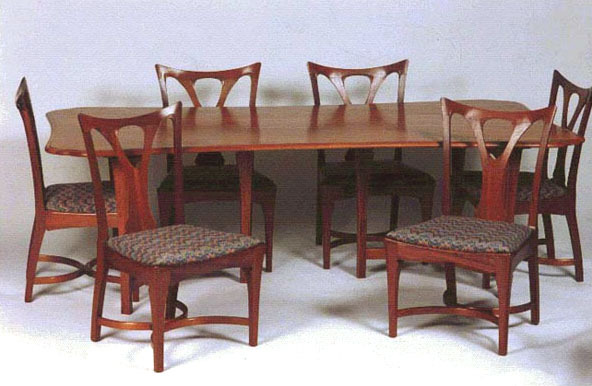 In the 1980s, I was asked to submit an entry to a bicentennial exhibition of American Furniture, held at the Harrison Grey Otis House in Boston. 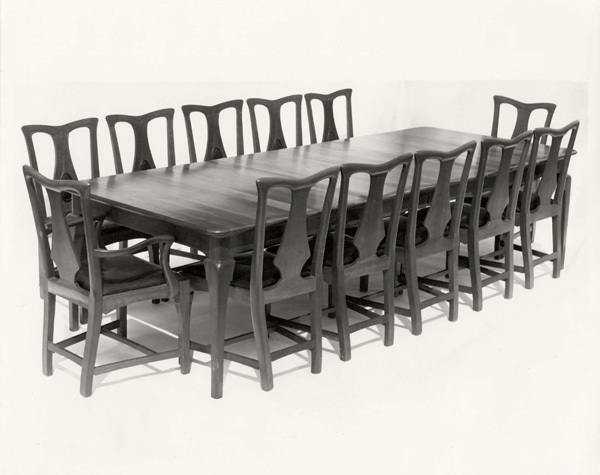 I produced a set of six hand-carved mahogany chairs with a finely carved center splat and crest rail, and bent-laminated and carved stretchers. The slip seat was upholstered with a blue bargello fabric. The matching table was not to emerge until seven years later, as a number of much welcomed private and commercial commissions kept me from building my own designs in those early years. 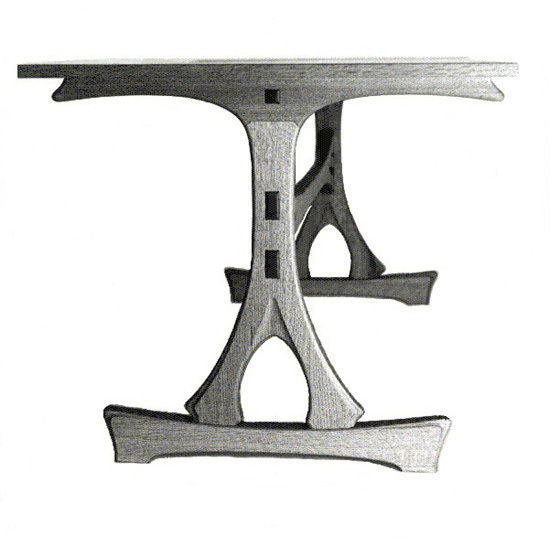 The table when built shared a similar bent-lamination in the base of the two solid mahogany tripod pedestals. 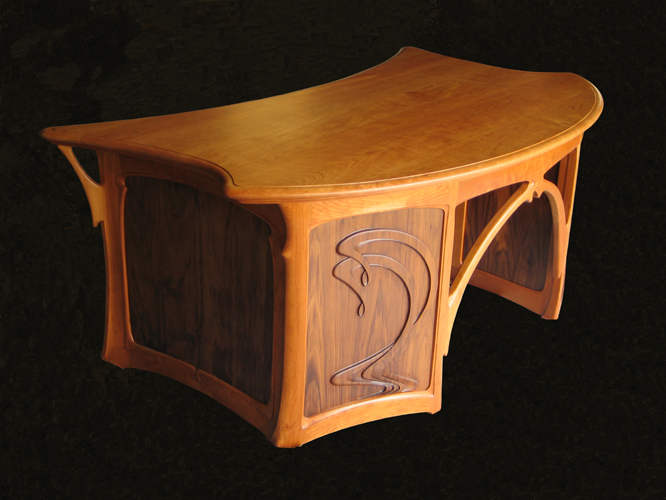 A hand carved molding surrounds the sinuous, curving form of the solid mahogany table top. We have built a number of desks and office suites over the years, but our range of Art Nouveau Desks remain the most sought after. This variation is made of solid walnut and cherry, and is hand-carved. It also has a privacy screen in the kneehole. 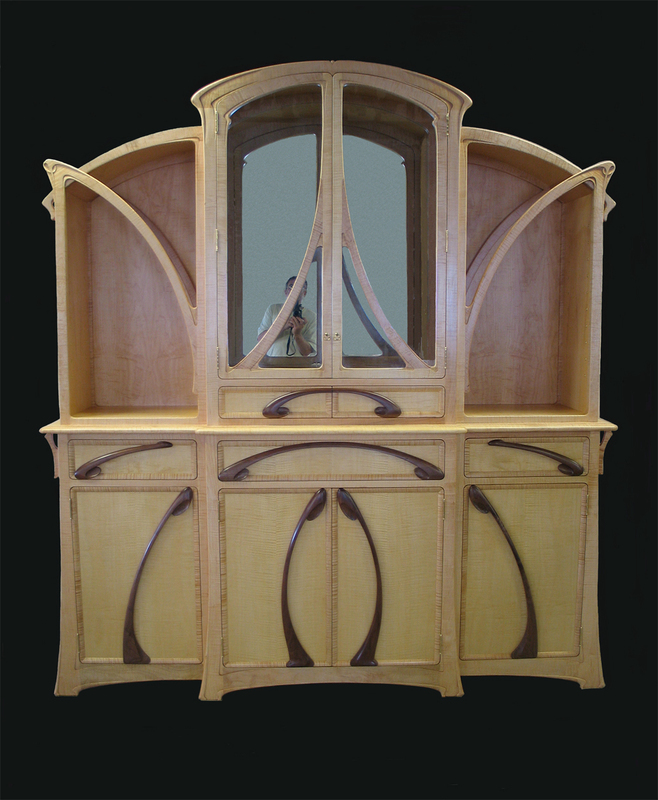 All variations of the Art Nouveau Desk are curved and hand-carved on all four sides, and the top is a unique parabolic shape. 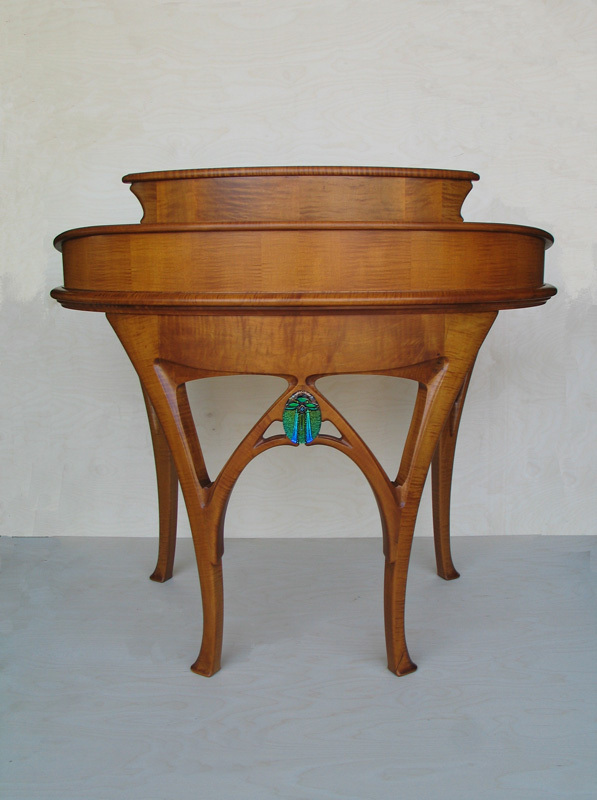 My original 'Art Nouveau Desk', also seen on this website, was a smaller scale and was designed and built on speculation between 1979-1980. It is representative of the fluid style of the art nouveau period (at its height between 1890-1905), and it demonstrates my continuous involvement with art nouveau over the length of my career. Although this desk was inspired by the work of the art nouveau period designer Hector Guimard, it is not a reproduction of any of his work. This Art-Nouveau inspired desk emerged as part of a client's desire for a working 'home' office environment for himself and his wife/partner. This particular desk was intended to serve as a 'laptop' station for his work as a designer/consultant. A creative writer saw this desk and instantly declared it 'inspirational'. The desk itself was built from solid, hand-carved curly maple, with a curved, pigeonhole gallery built onto the primary working surface. The desk is delicate and has many exceptional hand-carved details, including the sloping gallery shelves. The desk faces outward, featuring a custom-made art glass scarab, with light reflective, fused diachronic elements embedded in the composition. An exceptional jewelry designer in Cambridge, Massachusetts approached me about designing cases for his new retail facility on Massachusetts Avenue. He was intrigued by my Art Nouveau designs, but as a working artist had a limited budget. The challenge was to design a number of cases for a long and quite narrow space, with a matching stair leading to the consulting area and workshops below. The cherry wood, glass-topped cases that emerged from the design process featured inlaid marquetry panels, with a sinuous, Art Nouveau-inspired 'whiplash' design. The adjacent stair rail was originally designed for forged iron, but for the sake of economy the design was sandblasted into a tempered glass panel with wood and metal framing. We appreciate the opportunity to place our work in public or retail settings, and as a custom shop, we specialize in accommodating our client's needs for commercial as well as residential environments. 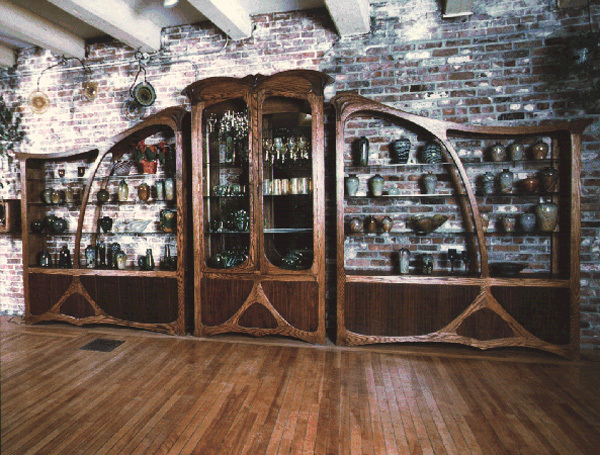 In the late 1970s, I was asked to design display cases for a new art glass gallery opening in Portsmouth, New Hampshire. This small, coastal village one hour north of Boston had been a seaport for all of its existence, but was now fast becoming a center for art and creativity. The Art Nouveau display cases that I designed and built for this gallery launched my career, and my signature style. One client saw these display cases and wanted a similar effect for bookcases in his own residence. Since it was a typical residence, the dimensions would be scaled down, and the individual sections would be more manageable. As in the original Art Nouveau case for Salamandre Glass, the lines of the design sweep across all three sections, unifying the whole composition vertically as well as horizontally. In these bookcases, we were able to design and cast custom hardware that unifies the lower doors and drawers. 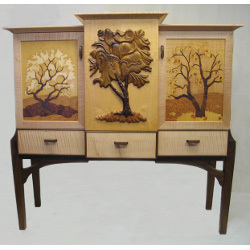 The hand-carving on these cherry wood cabinets was much more developed than on the commercial piece. I was able to create a 3-dimensional cornice across the crest and around the sides of the three sections, matched by a similar treatment at the base of the cases. The rolled scroll appears in this carving, which has become a recurring motif in my work. Similarly, the sweeping, Art Nouveau line of the brace in the upper cases has appeared in varying forms across decades of my work. This king size bed was created in response to a client's wish for a design with this theme. The hand-carved headboard and footboard represent opposing swans, while the graceful curving necks and heads of the birds serve as the four bedposts. The bed also includes marquetry panels of pond scenes, made of various exotic woods and mother-of-pearl inlays. This piece derives from our continuing interest in the naturalistic designs of the Art Nouveau period. 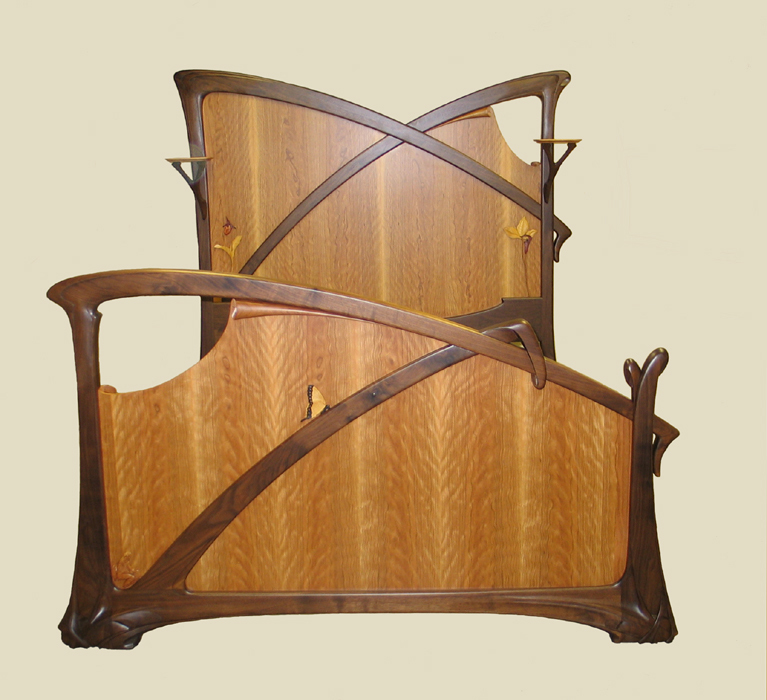 All of our bed designs can be made in any size, or combinations of woods to accommodate individual needs and taste. 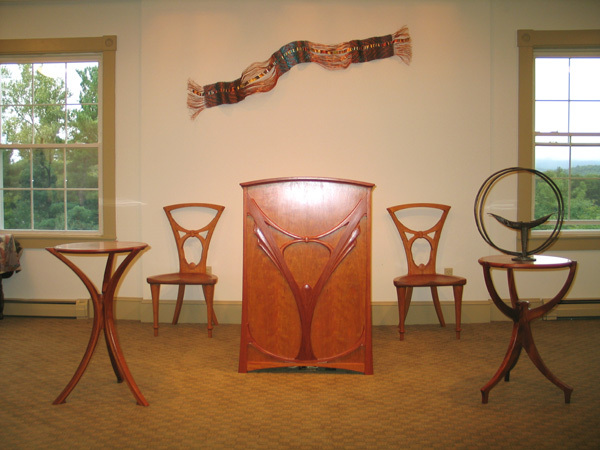 This chair was one of two designed and built as part of an installation of clerical furnishings for the sanctuary of a Unitarian Church. Design motifs consist of highly stylized imagery suggesting upraised hands interlocked in a knot, symbolizing the unification of faiths. The design also builds on the values of spiritual focus, economy of design and structural integrity. The hand-hewn texture of the carved seat emphasizes the 'truth to materials' that was part of the credo of the arts and crafts movement. This armchair was designed and built as two of a set of twelve chairs for a New Hampshire residence. It provided me with the opportunity to develop and refine some of the basic Art Nouveau motifs that would become part of my design signature, as they evolved over the years. The carving design of the crest rail, back splat and apron reappear in varying forms in my work. I was able to use leather for the seat and back splat, which supports a clear definition of the form, and a more uniform coloration. This armchair appeared in an exhibition in Boston, and was selected for publication in the “At Home” section of the Boston Globe, on 11-16-1984. In the mid-1980s, I designed this chair for an alumni exhibition of the North Bennet Street School, where I had learned my craft. Unlike many students and even graduates of the furniture program, I was ready to step back from the traditional designs that we had been taught and branch out on my own. This chair was an early departure from classic styles, but it definitely uses classical chair proportions and construction methods. The crest, backsplat and apron provide an early example of the carved lines that would emerge throughout my later work. 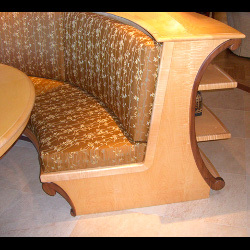 Another original element is the curved, carved, and bent-laminated bracing that unifies the base and legs of the chair. It serves as a focal point of the chair, while providing exceptional strength. This chair evolved out of a request from a client for chairs inspired by the designs of the Arts and Crafts artist Arthur Heygate Mackmurdo. 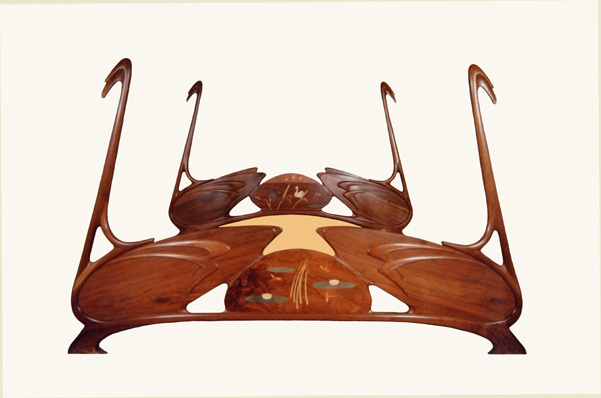 One particular Mackmurdo chair of the 1880's was a seminal work of the emerging Art Nouveau period, and was coincidentally on tour with the Art Nouveau Exhibition at the National Gallery of Art in Washington, DC. I traveled to the show to view the chair, and this design is a contemporary adaptation from the original. 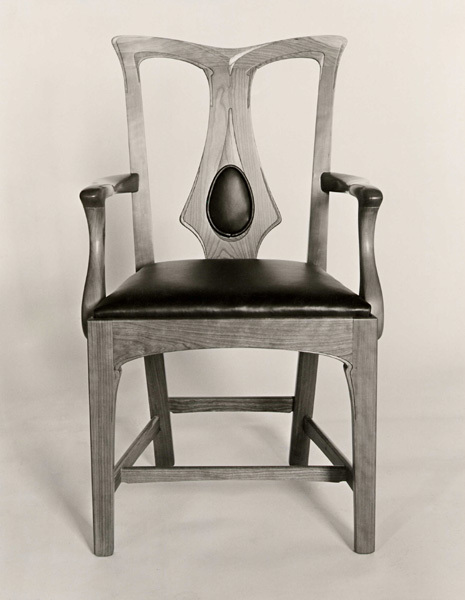 The manufacturing process for this chair was as intriguing as the design, which resulted in its publication in Fine Woodworking Magazine in 2002. Several years after I had built a Regency Dining Table for their coastal home in New Hampshire, clients contacted me to discuss furnishings for their new residence in Naples. Although they were avid collectors of fine antiques, they entertained large parties, and needed custom furniture built to compliment their antiques. They had ordered another Regency period dining table, this time in the style of King George IV of England. This was made in cherry wood, and the pedestals were more ornately carved. To accompany this table they needed chairs, but were looking for something different. We came upon a chair of the Beidermeier style, which evolved in Austria and Germany, almost concurrent with the Regency period In England. The model for this particular chair is thought to have been designed by Joseph Danhauser, and built in the Danhauser Furniture Factory in Vienna, Austria between 1830-1840. 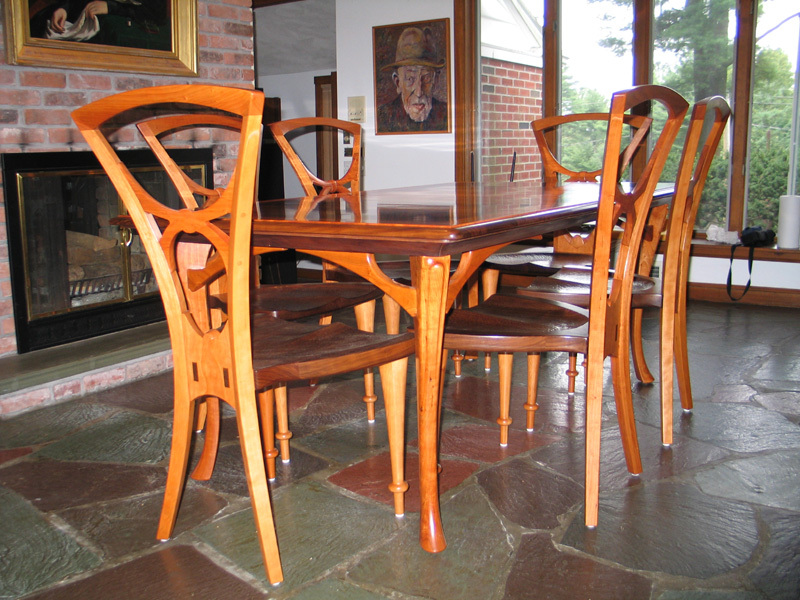 We made our version of these chairs in cherry to match the table, rather than the customary beech wood of the period. 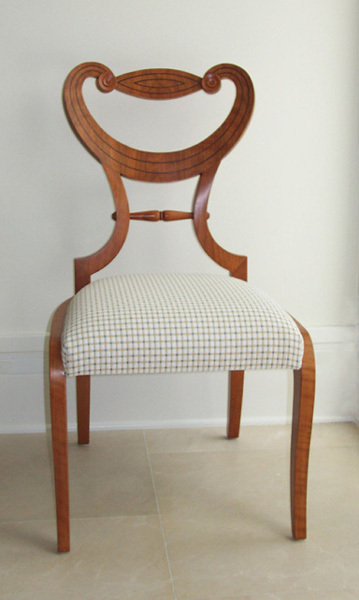 The chair design is deceptively modern to this day, even though it dates to the early 1800s. There are no stretchers, so the smooth curves of the legs are clearly expressed. The chair back was also bold in its simplicity of form. After considering the possibilities of construction, I chose to make this back of bent laminations, which were then veneered with cherry. Fine brass pin striping was inlaid into the chair back to replace the ebony in the original, to create contrast and further define the curves. In the 1970s and 1980s, the Salamandre Glass Gallery and Showroom In Portsmouth, New Hampshire provided me with the opportunity to display my own design sense in a very public forum. Although these artisans were not able to pay much, they allowed me to express my affinity for the Art Nouveau period – which was also renowned for such famous glass artists as Emile Galle and Louis Comfort Tiffany. This secretary was commissioned by one of my early patrons, who saw my work in Portsmouth and wanted unique furnishings for his residence in rural New Hampshire. He needed a very serviceable desk with innumerable drawers and pigeonholes for his paperwork, and ‘secret’ locked compartments for valuables. When closed, this secretary desk features 6 drawers flanking a kneehole area with a locked compartment in the recess. A full drawer spans the front, and the slant-top, drop front desk sits above that, with pull-out supports. The upper case is framed in cherry with black walnut panels, with a carved black walnut crown and cherry pediment rising above. The entire upper case is carved in the undulating art nouveau lines that distinguished the Salamandre Glass cases, and the custom-designed and cast brass hardware follows this curvature. When opened, the desk and upper case reveal a warren of nested spaces and compartments, some with tiny doors, some with locks, and some with little drawers. This ‘workspace’ allowed for multi-tasking, and promoted organization for a businessman who traveled extensively. This mantelpiece surround was designed and built as part of an entire suite of furnishings for a 'Great Room' in a home on the Gulf of Mexico. The property borders a bird sanctuary, and the designers could not ignore the splendor of the birds and flowers in their natural habitat adjacent to and visible from the room itself. 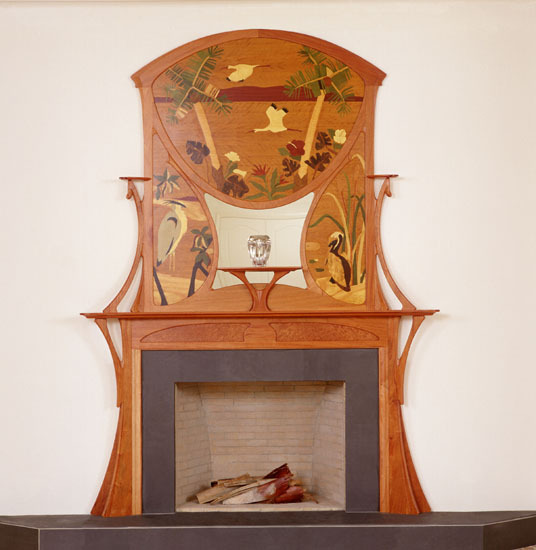 The marquetry design installed on this mantelpiece reflects the landscape, birds and flowers in the surrounding environment, and serves as a bridge between the interior and exterior spaces. The marquetry installation was drawn and cut from over twenty different woods to match the color, tone and grain of the trees, plants, pelicans, herons, and roseate spoonbills it illustrates. 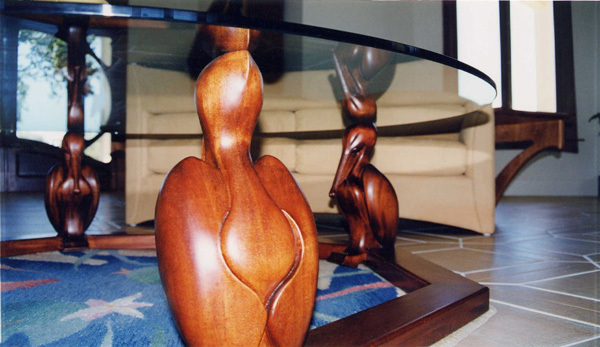 While we do not repair or replicate the marquetry designs of other artisans, we are happy to create a unique image or landscape in marquetry or parquetry as part of a special project or piece of furniture. The Art Nouveau Display Case is one of two designed to mirror each other, as part of a complete and original 'Great Room' in the art nouveau style. The cases house a collection of art glass and pottery, in a room filled with natural light. The 14-foot ceilings allow for a dynamic sweep of line that lends itself to the overall design statement, continued through the other furnishings and the Art Nouveau Doors, windows and bar. The design for the doors evolved from the client's interest in the work of the Art Nouveau architect Victor Horta. The project resulted in two pairs of doors installed in opposing entrances. The Art Nouveau doors are built of mahogany wood, with egrets sandblasted into stationary glass sidelights that expand the views to the Gulf of Mexico. The carved fanlight above the doors is designed to suggest the omnipresent solar energy of the immediate environment, while carrying on the 18th century tradition of the clamshell motif. All the tempered glass used in the doors is hurricane-proof, and held in place with multiple hand-carved stops, which artfully hold the glass in place and allow for replacement as needed. 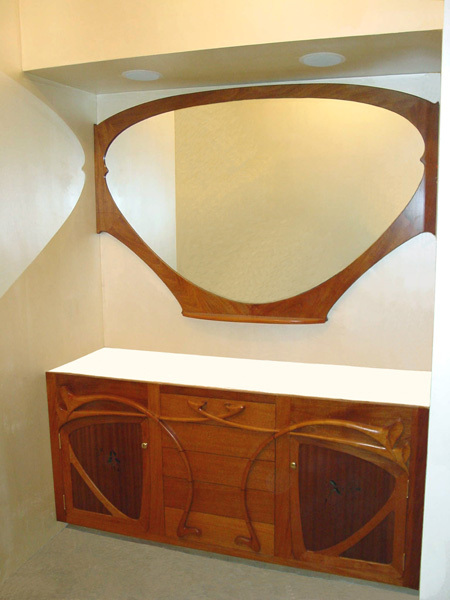 This Art Nouveau style cabinet is a lady's vanity with mirror. It was designed to accommodate wash basins glazed with calla lilies, and reflects the forms of that elegant flower. The cabinet was constructed of mahoghany, with abstract flower forms, carved and applied with additional pierced work to provide for ventilation, and was finished with a marble top per customer request. It was permanently installed in a narrow alcove as part of a bedroom suite. The matching mirror has hand-carved framing. 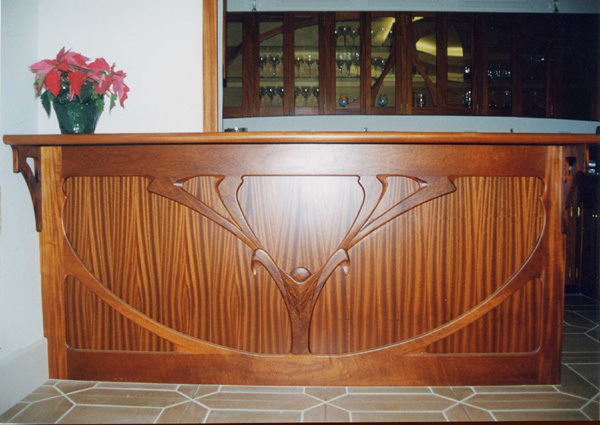 This cabinet was designed in response to a client's prior purchase of elements with a calla lily motif. As our ongoing resource is the naturalistic elements and sinuous lines of the Art Nouveau period, we readily incorporated the beautiful Calla lily into our design motifs. In this case, the stems of the Calla lily became the handles of the drawers, in a long sweeping line that crosses several doors and drawers and makes them as one. Functional items need not be bought from catalogs, showrooms or plumbing suppliers. We work with many professionals to supply all of our clients' needs and desires. One of my first commissions came from friends in the town where I was raised as a child. The couple had watched me grow up and were intrigued my new skills and confidence. They needed a coffee table, and gave me free rein in the design. We decided on a design where the structural elements of the design could be visible through the glass top. 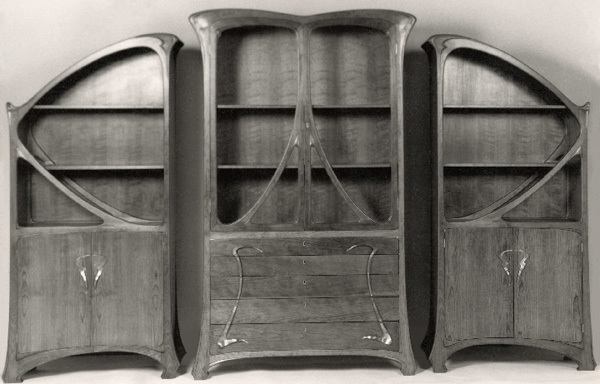 The concept rested upon my interest in curved lines, and my desire to find methods to bend wood into linear forms as seen in the work of Thonet and the Art Nouveau period. Ash wood was chosen due to the fact that it is a light colored wood known for its strength and ease in bending. I experimented with steam bending and came up with the 'whiplash' curves that help suspend the glass. The sculptured molding of the legs and the table edge are drawn up and out to provide additional support for the heavy top. The sculptural forms that emerge at the tips of the wood can be seen in other designs of that period, and evolve into a vocabulary that runs through my work to this day. This singular table was a first attempt at formulating my own design sense in wood. The concept was premised on a falling leaf, and the table itself seems to be floating through the air on its delicate, dancer’s legs. The top emulates the five lobes of a maple leaf, while the banding around the edge provides a leaf-like framework to support and interlock the slender legs. The fifth corner of the table top is turned down to create a naturalistic curve, and emphasize its free suspension in space. The suspended ‘stretchers’ add to the defiance of gravity, and defiance of rules for furniture-making. 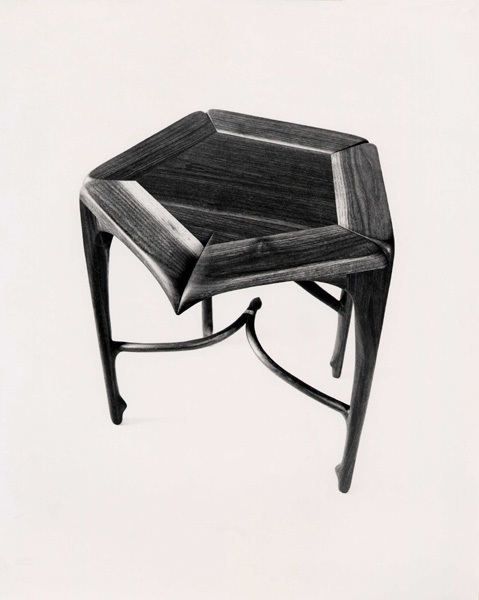 In 1976, I exhibited this table in a show of “Wood and Fabric” at The Society of Arts and Crafts, in Boston, Massachusetts. 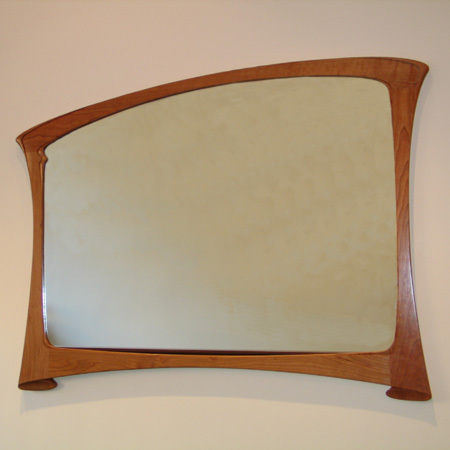 I had started it in the woodshop of the University of New Hampshire in 1974, and finished it in my own shop in 1975. While I received a thorough education in craftsmanship at the North Bennet Street School, I emerged from their program without the ability to transfer my classical training to new designs of my own. I began this process at UNH, and quickly found my own form of expression, having gained the prerequisite skills at NBSS. When regular clients decided to purchase an adjacent lot and expand their Florida home, I was called in as a consulting designer from the beginning of the architectural discussions. The new wing was to encompass a ‘Great Room’ to accommodate extensive entertaining. We were able to design and build architectural windows and doors, a bar kitchen, stairwell and furnishings for this room. Among the small pleasures of this space is this coffee table, which is centered in the large space and surrounded by four matching couches. The property as a whole, and this room in particular, overlooks an adjacent bird sanctuary, and the avian population inspired several aspects of this project. In this case, we chose the ever-present pelican as the theme. Typically they sit patiently on posts overlooking the water to spot their dinner swimming by. The base of this table celebrates these birds, as four of them sit overlooking a hand woven rug made to simulate a carp pond. In approaching this project, I called upon an old friend and bird carver, Fred Dolan of Strafford, New Hampshire. Fred has been recognized by the Smithsonian as a major American craftsman, and exhibited at the museum in Washington, DC. Fred helped me block out the massing and proportions of the four birds supporting the glass-top table, then I refined the details based on observation and stylization. The pelican’s feet rest on a ring of mahogany that encircles the ‘pool’ below, and anchors the birds to the structure as a whole. This table was inspired by the 'torii' arch of Chinese and Japanese origin. I have studied the roots of Art Nouveau design in the Japanese woodblock prints of the 19th century, and the 'torii' arch and the Hokusai wave design have particularly influenced my work. This table was a gift to a friend, and emerged completely from my subconscious, unencumbered by requirements. The wood was what I had available, oak for the base and wide pine boards for the top. I have made later models of this table in other woods, as part of commissioned work. This particular table is the most fluid in its design and execution. This grouping was conceptualized as an informal dining area for daily family use, while the complimentary formal dining room was reserved for entertaining. The round, curly maple, pedestal-base table features an inlaid marquetry shell design of various exotic woods. The 4-legged walnut pedestal is centered on a raised curly maple dais for further stability. The 180-degree, curved, curly maple upholstered banquette/bookcase is built into the floor, and well as the structural columns that support the great expanse of the room. While this can be removed the intention is stability for daily use by children inclined to climb aboard. It served its functional purpose well, while still being unique and elegant in appearance. The entire banquette is arranged to face out to a tidal inlet and pond, usually inhabited by swans and native birds of the adjacent sanctuary. I had worked for these clients on their home in New York, and was engaged to build furnishings for a new residence in Florida. When they expanded onto the adjacent lot 1n 1998-2000, I was able to be part of the initial design phase with the architects, and designed and built the architectural doors, windows, staircase and bar kitchen of the Great Room, as well as the furnishings. In a third expansion in 2006-2007, the original wing of the house was expanded and re-visioned, and this dining room was a part of that concept. It was determined that the furnishings be of a light colored wood, and curly or tiger maple was chosen as the primary with black walnut as the secondary wood. The curly maple table design emerged as a variation of the several pedestal-based Regency period tables that I had made for other clients. It retains the inlaid border of classic Regency tables, while reversing the color contrast to a light table with a dark walnut inlay. This pedestal base was selected from a series of others that I had designed for this commission, and inverts the traditional tripod post of the classic Regency form. The chairs for this dining room drew upon Art Nouveau forms and lines that I have been exploring for over 30 years, and retain specific carved motifs seen in other pieces, such as the Tamworth Chair. In many lights, the exceptional curly maple of these chairs becomes the predominant design element, therefore a simple solid textile was selected to emphasize the form. I was contacted by a professional jeweler who was opening a new shop on Massachusetts Avenue near Harvard Square. He has found my website, and wanted to meet to show me the new space he was setting up. I genuinely admired his work, and we talked at length about our efforts to build careers in the arts while not compromising our designs or quality. He wanted me to design a continuous run of seven interconnected mahogany display cabinets to wind in a serpentine fashion through the long narrow space. The cases would stand on slender legs and have glass tops and fronts, with locking wood sliders in the rear of each case. We decided on a marquetry inlay on the central panel of each facade, in pale holly wood, to add contrast and a subtle decorative motif. Two narrowness of the space was compensated by the fact that there were two levels, and the level below the street functioned as a private reception room with workshops behind. The open stairwell created a liability that encouraged us to design an art nouveau fencing to be built in bent-laminated wood with iron. Ultimately, we needed a more cost-effective solution, and so had the same design engraved in tempered glass. The benches and mirrors continue the art nouveau motif used throughout the space. I was contacted by the Rector of a Unitarian-Universalist Congregation in the Lakes region of New Hamsphire. She had seen my work on the internet, and realized that she had seen some of my work at other venues in New Hampshire. She wondered if I would consider a project for their new church home, a historic Greek Revival schoolhouse that was being restored to its former glory. The church leaders had allowed that some new furnishings were needed for the Sanctuary, and asked if I could work within their serious limits. I met with the church committee several times, and we determined that they required a lecturn, two chairs for guests, a candle stand, and an additional table for elements of the service. All pieces would be made of solid mahogany. They had very limited funds for this project, but it came together and we were pleased to attend the opening service. The chair we designed for this grouping was admired by several future clients, so we did build another set of chairs that helped offset the loss on this project. After I built the Salamandre Glass Showroom in Portsmouth, New Hampshire in the 1970s, I began to receive recognition from the entrepreneurial class that was discovering the potential of this old seaport village. This 1982 commission was for the rural home of one such businessman, who had relocated from the Midwest for the opportunities that this greater Boston community offers to this day. While this solid cherry table is more reserved than much of my later work, I was able to expand my design repertoire in the design of the chair. The carving on the crest rail, back splat and apron of the chair helped to formulate the art nouveau motifs that I still explore today. The two armchairs emphasize the continuity of sinuous line. I was able to use leather for the seat and back splat, which supports a clear definition of the form, and a more uniform coloration. This armchair appeared in an exhibition in Boston, and was selected for publication in the Boston Globe on 11-16-1984. 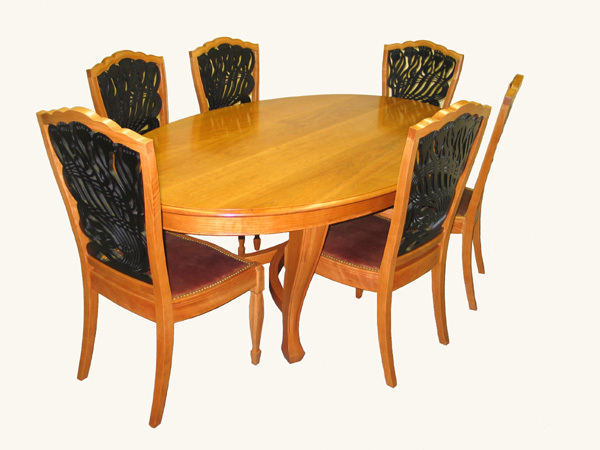 This Art Nouveau inspired dining room set was designed and built for the country house of a couple who also collect art. The clients wanted simplicity with originality, and visible craftsmanship. They saw another chair we had designed, and asked for a variation as part of a dining arrangement. We worked closely with these clients for several months, while refining drawings to reflect their vision and process, as well as our own. We enjoy working directly with clients to arrive at a design that they have ownership in, one that they choose to live with on a daily basis. The chairs were made of two woods - all vertical surfaces cherry, horizontal surfaces of walnut, with a hand-carved and faceted seat. 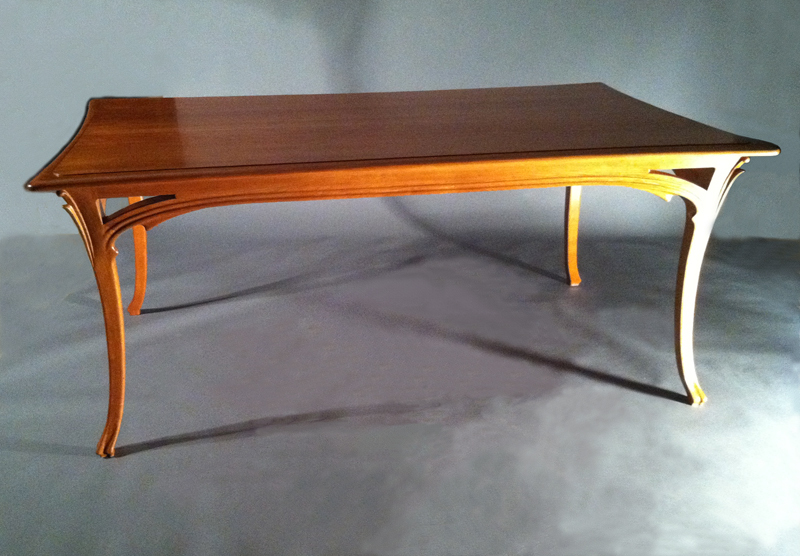 The table was also constructed with vertical elements of cherry and horizontal elements of walnut. The edge-banding around the tabletop was curly cherry. The legs and brackets are abstractions of dragonflies. I was commissioned to build a queen-size, curly maple bed as part of a suite of furniture for a client who is a practicing Buddhist. She expressed her appreciation of my Art Nouveau style and her interest in using that as foundation for a new direction in furniture design. After visiting her retreat and studying Buddhist texts and imagery, we agreed upon the iconography that would be the basis of the design. In this bed, I used a historic Buddhist image of a landscape with waterfalls, and engraved it in the center section of the headboard. This landscape was bracketed by panels with deeply carved lotus blossoms, which would reappear in various forms on other pieces of furniture in this suite. The entire form of the bed drew upon the curved lines of the Art Nouveau period, but merged serenely with the naturalism of the Buddhist elements. 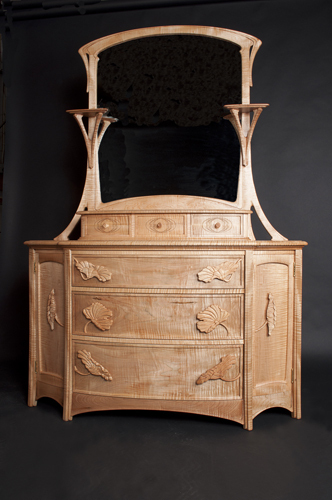 This dresser is part of a suite of furniture created for a client who is a practicing Buddhist. While she needed basic furnishings, she wanted them to reflect her spiritual life and create an environment conducive to daily meditation. This dresser compliments several other pieces in its use of the lotus blossom as a unifying symbol and ornamental motif, while the sinuous lines of the Art Nouveau style provide the form of the structure. 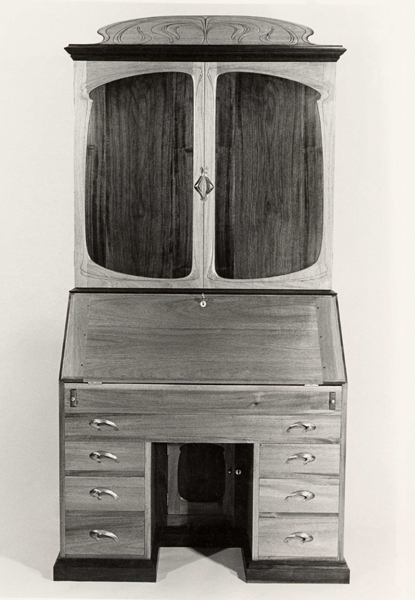 The lower case is divided into a central section that curves forward with three graduated drawers, flanked on either side with paneled compartments with concave doors. This undulating line is retained in the perimeter of the dresser top, which itself supports a gallery with three small drawers. A frame and mirror rise above this gallery, carved with mortarboard shelves on either side. The lower bracing of the mirror unifies the upper and lower elements of this dresser, and reach upward and outward into the brackets of the shelves. Carved lotus blossoms serve as handles for every drawer and door. 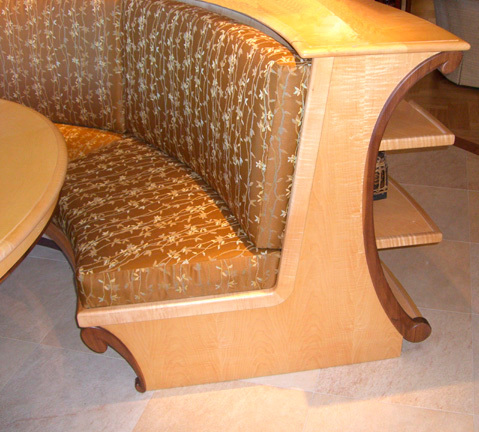 In 2008, I was contacted by a person expressing interest in my Art Nouveau furniture designs and we exchanged several detailed emails. She discussed her deep commitment to Buddhism, and indicated that she wanted furnishings that would be reflective of her spiritual life. Thereafter, I did not hear from her for almost a year. Suddenly, she was ready to more forward with the ideas and imagery that we had explored during our first communications. At her request, I traveled to Montana to review specific Buddhist images and iconography that was to be incorporated into the fluid lines of art nouveau cases. A criterion of the project was that no toxic chemicals be used, and it would be of total “Leeds’ environmental standards. In all, seven pieces were needed, and everything was to be built of solid wood. She opted for the lightness and strength of curly maple. This credenza is one of the pieces built for this client. While emulating a classic tripartite division of cabinets, it bows forward in a graceful, sweeping curve and then returns. The long curve of the top reflects this bow front, while the vertical supports fan out to the sides in similar delicate lines. The façade of credenza is slightly broken, with the two paneled doors of the central section projecting forward from the single panel sections on either side. All the doors incorporate hand carved panels within art nouveau carved framing, and open up to shelves and file drawers used in this singular office. The lotus blossom is the central theme of this piece, and every panel has carved lotus flowers in various stages of openness. These blossoms are carved in high relief, which allows a play of light and shadow despite the single pale color of the entirety. 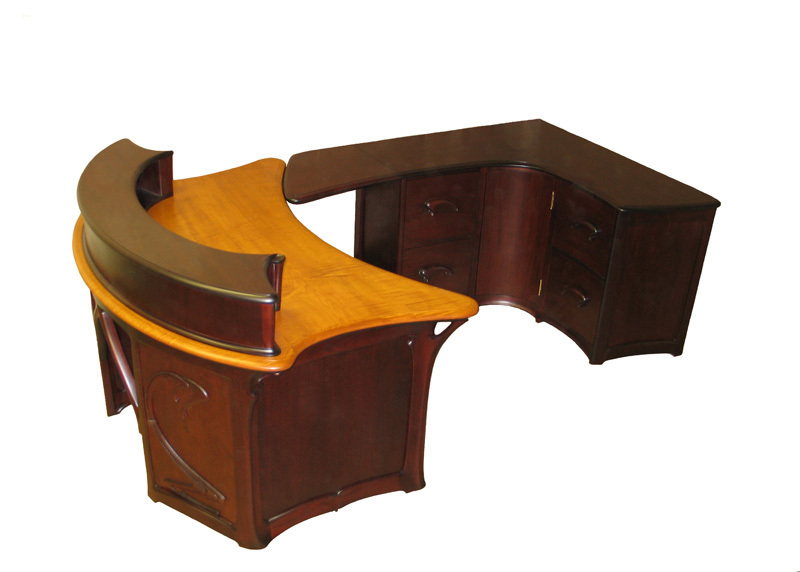 This is the most complex of the 'Art Nouveau' line of desks in this design. It includes the gallery component, as well as a matching, curved 'Back Desk' that serves as additional work- and storage space in an efficient, wrap-around design. It is built from mahogany and curly maple woods, with a Hokusai-inspired wave carving in the front panels. The framing, brackets, door fronts and door handles of this desk are all hand-carved from sold wood. 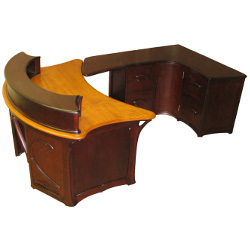 The desktop itself is in a unique, parabolic design in sold cherry, with curved wings and carved molding. This trio of display cases was made as part of a suite for a retail facility specializing in hand-blown art glass and on-site glassblowing. Art glass was a singular expression of the Art Nouveau period, culminating in the work of Louis Comfort Tiffany and Emile Galle, among others. 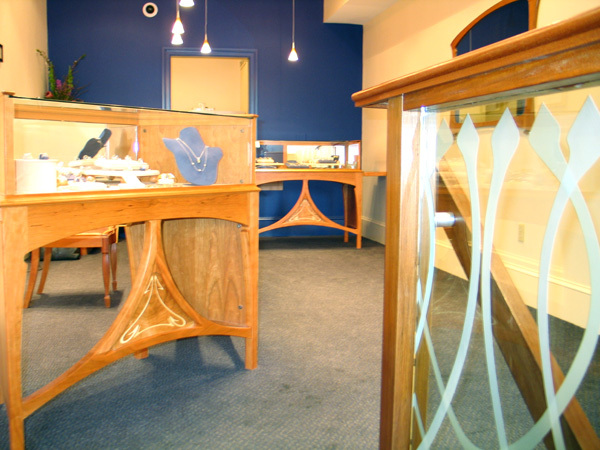 The sweeping curves of these Art Nouveau Display Cases pay homage to that tradition and that era. The woods used in the cases include oak panels within hand-carved mahoghany stiles and rails that comprise the framing of the structure. We appreciate the opportunity to place our work in public or retail settings, and as a custom shop, we specialize in accommodating our client’s needs for commercial as well as residential environments. This curly maple and walnut cellaret was originally accepted for the 2012 Furniture Society invitational show in Portland, Maine. Unfortunately, it was not finished in time, but that allowed certain elements of the carving to evolve into their present configuration. 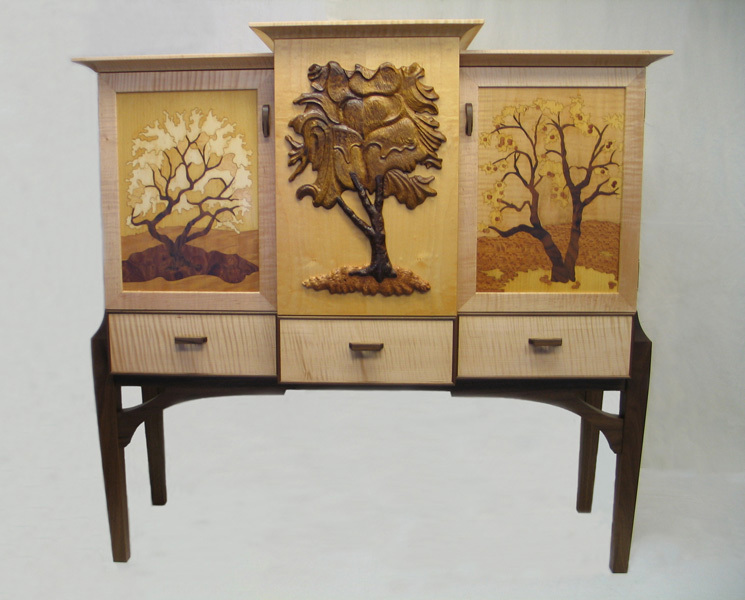 The two side doors have marquetry panels representing apple trees in spring and fall, designed by Anne Long. I carved the apple tree in summer on the center panel of apple wood and walnut burl, and applied it to the solid maple case. The cellaret has a lift top center cavity to hold wine and/or liquor bottles and mixers. It is attached with safety-lock hinges to the main case. The side compartments have movable shelves to house stemware, tumblers and other mixers or glasses. Three drawers are provided for wine and beer openers, stirrers, napkins and other necessities.